Birth of Michael Allen Malpass on August 18, in Yonkers, NY. Awarded art medal at St. Peter & Paul Elementary School in Mt. Vernon, NY. At 17, paints mural commemorating death of President John F. Kennedy on his bedroom wall in the family apartment in Bronxville, NY. Michael and Cathleen Anne O'Donnell meet. Awarded football's Best Defensive Player trophy as a high school senior. Graduates Archbishop Stepinac High School in White Plains, NY. Begins at College of St. Thomas in St. Paul, MN on a football scholarship. Leaves college and returns home in January. Enrolls at Pratt Institue, Brooklyn NY, in September. Begins studying alongside sculptor/professor John Pai, who introduces Michael to welding. Earns BFA from Pratt Institute; begins working on MFA as technician in Pratt welding shop. Michael and Cathleen marry in September. Drafted into US Army in July, stationed in Berlin in December. Cathleen joins Michael in Berlin in February. Birth of son, Michael, in June. Returns to Pratt Institute to complete MFA. Appointed Instructor of Sculpture, Welding, and Forge. Family moves to Pratt faculty housing. Michael starts making jewelry and prints. Earns MFA from Pratt Institute. Cathleen begins promoting Michael's artwork. First one-person show at the Betty Parsons Gallery. Chicken man appears on cover of ARTnews magazine featuring Betty Parsons. Family moves to shore house in Bricktown, NJ. Michael continues teaching at Pratt, commuting home on weekends. Created a majority of collages and illustrations during this time. 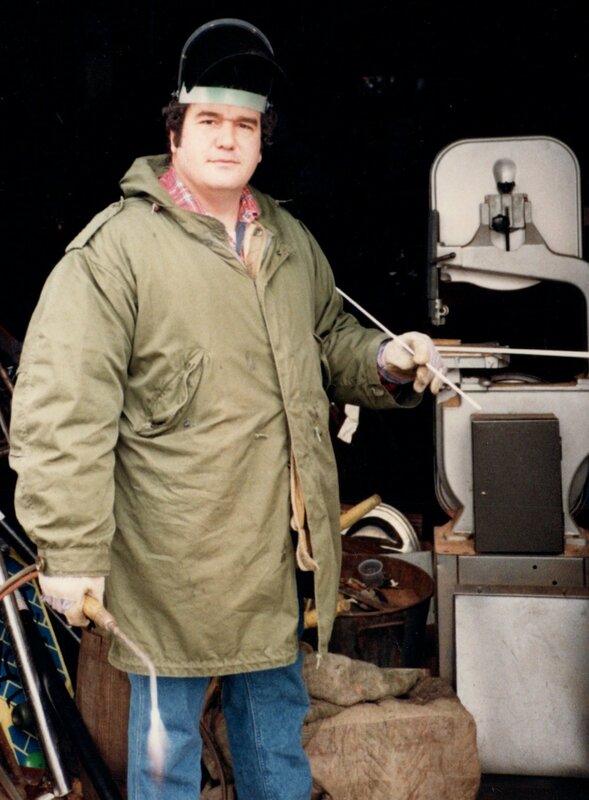 Michael develops Kienboch's Disease (losing 70% of movements in his right wrist); unable to forge, he purchases bandsaw to slice bronze, marking the beginning of the bronze spheres. Michael leaves Pratt to live with family in NJ, becoming a house sculptor. Productive period with simultaneous commissions, gallery shows, exhibits, and museum interest. Death of Michael Allen Malpass at age 44 on February 13 at Brooklyn College.